Our 34-Inch Sunset Flower Wall Art is perfect for creating a serene, tranquil environment in your garden, on your deck or in a screened-in porch. 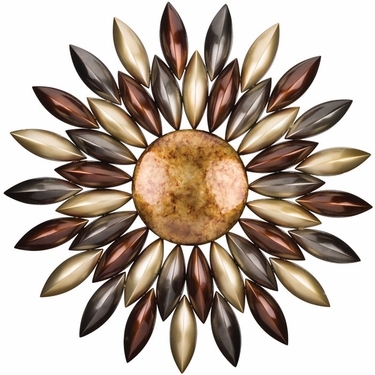 This beautiful array of metal petals surrounds an antiqued center in perfect symmetry, bringing balance and peace to nearly any outdoor space. In relaxing hues of deep burgundy, silvery gray and pearly white, this gorgeous floral-themed wall art might be exactly what you need to create a calm, soothing space. Measuring 34 inches by 34 inches and made entirely of metal, our Sunset Flower Wall Art serves as the perfect focal point. It can easily complement the natural colors of your outdoor space and accent your existing decor.